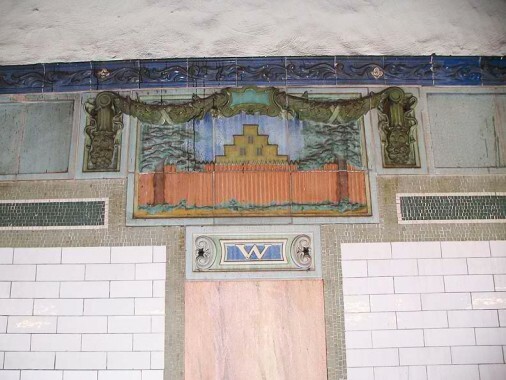 The Wall Street station’s ceramic plaques depict the defensive wall set up by the Dutch in the approximate location of today’s titular street to protect New Amsterdam, or New Netherland, against any Indian tribes or enemy British who may have wanted to invade. 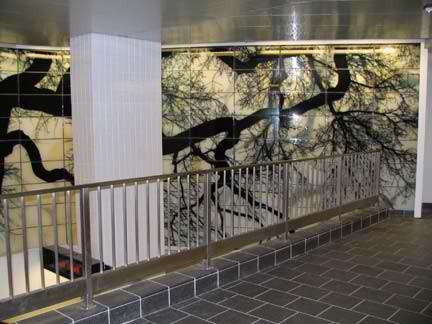 A Dutch house, typical with its stepped roof line, can be seen in the background, with trees resembling cedars on each side. 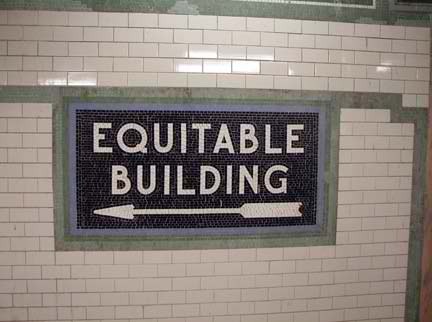 Accompanying each plaque is a stylized letter W. The plaque was produced by Rookwood Pottery. The Cincinnati pottery, instituted by Maria Longworth Nichols in 1880, was the first female-owned manufacturing company in the USA and is still going strong today. During the subways’ 1970s and 1980s modernizing craze, the Wall Street station was updated with a thick layer of glazed dark blue brick laid on top of the station’s older off-white tilework, with the original 1905 dark blue nameplates poking through; the old ceramic plaques were preserved as well. 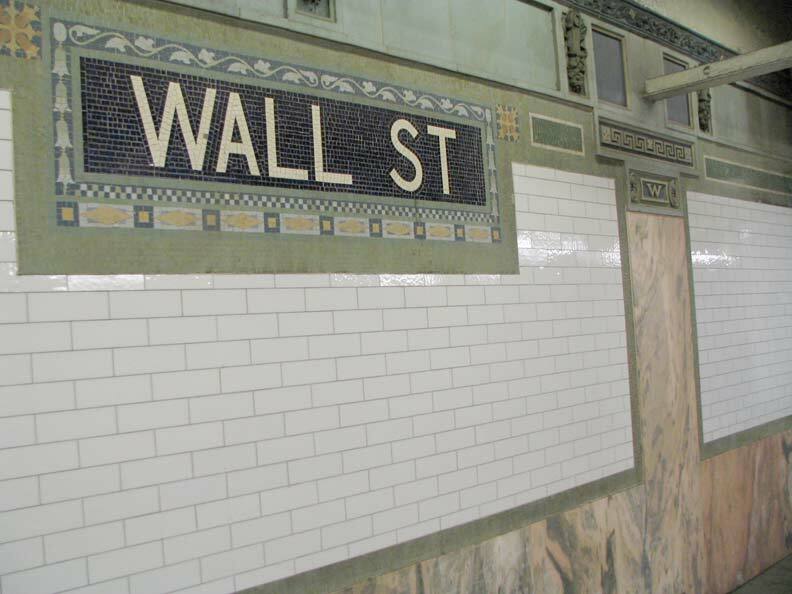 Burnt orange was usually the color of choice during these subway renovations, as at Bowling Green (#4, #5) and 49th Street (N, R) so Wall Street always had a unique look to it whenever I passed through on the train. 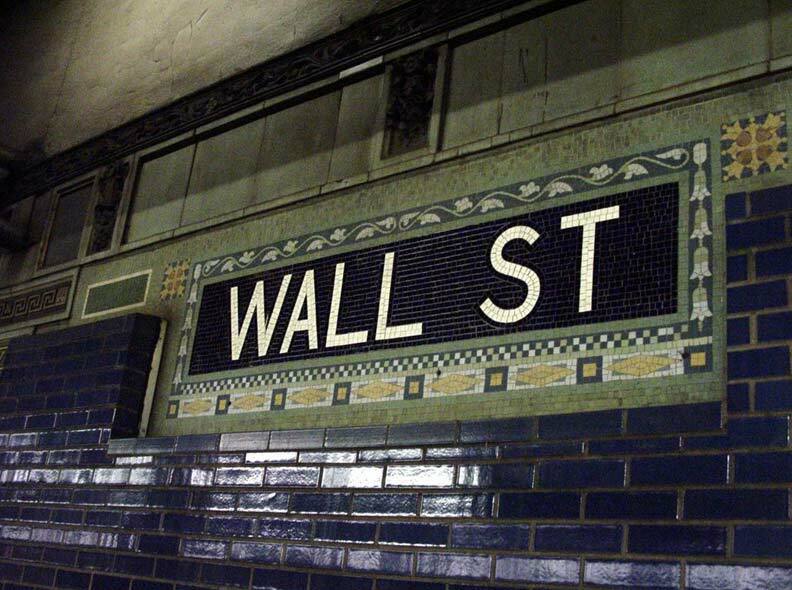 That state of affairs lasted about 25 years until a more recent renovation got rid of the blue bricks and restored Wall Street’s original off-white tiles and marbleized columns and panels. 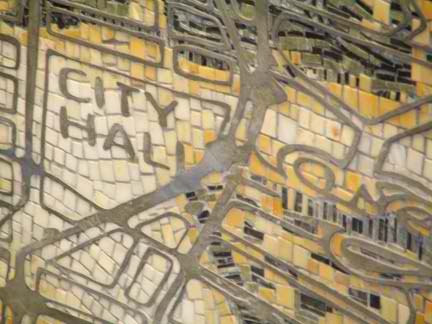 The plaques got a scrubbing and restoration, as well. 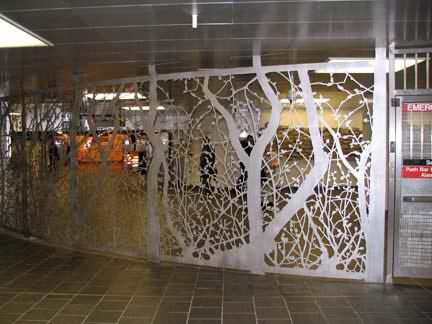 The station is close to what original designers Heins and LaFarge had in mind at the turn of the 20th Century. The southbound platform features a wood ticket booth, ticket chopper, and remaining wood doors on the men’s and women’s bathrooms. 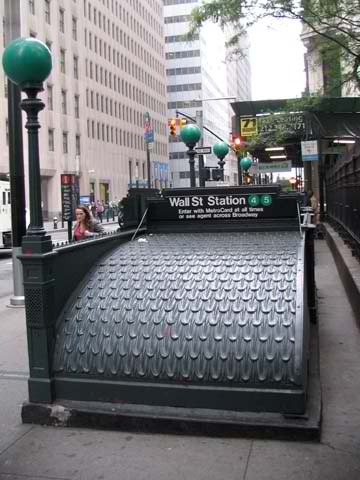 I’m not sure if this is Wall Street’s original ticket booth, but if it isn’t, it appears to be a fair reproduction. 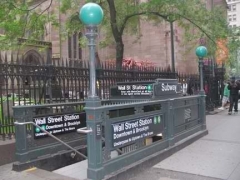 In the subways’ early days, riders purchased a ticket at the booth, then walked to the attendant at the ticket chopper who would insert the ticket into it; the fare control area was fenced off from the platform area. 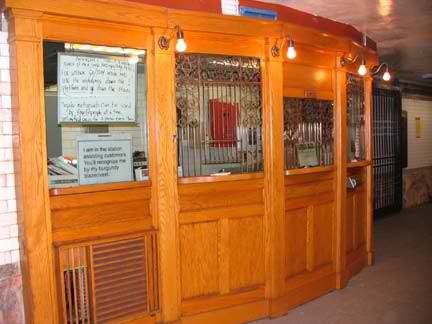 Tokens and turnstiles came along later. 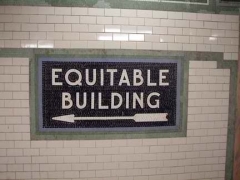 The Wall Street station has an exit directly into the venerable Equitable Building on Broadway, as well as a pair of mosaic signs. 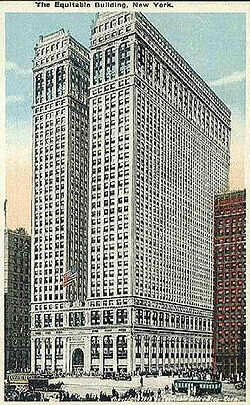 When the 40-story skyscraper opened in 1916, it cast a large shadow over the downtown area, prompting lawmakers to enact the 1916 Zoning Resolution that aimed at restricting the height and bulk of buildings, allowing light to penetrate to the streets below. 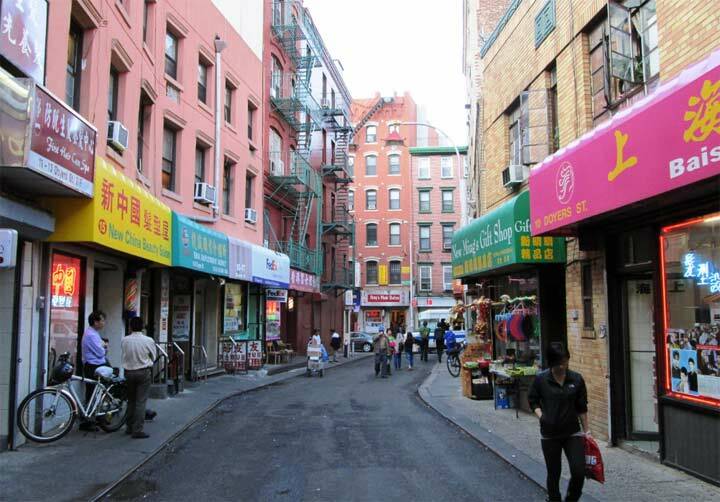 It served to create the stepped-back upper floors so prevalent in 1920s buildings. 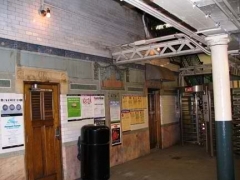 Though the large IRT entrance and exit kiosks have largely disappeared from the city scene, some old fashioned entrances can still be found, like this one at the Wall Street station at Broadway and Trinity Cemetery. The green light indicates this station is n entrance 24/7. A pair of glass-canopied escalator/staircase entrances empties passengers out to Peter Minuit Plaza, which is still undergoing a big dig, with construction shrouds in evidence. 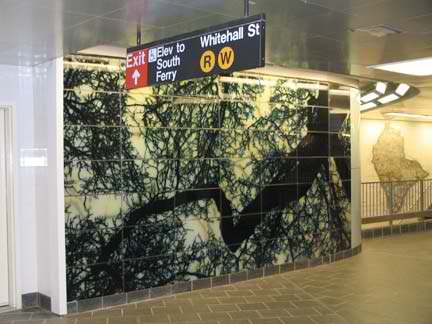 The station also connects to the new (2005) ferry terminal building. 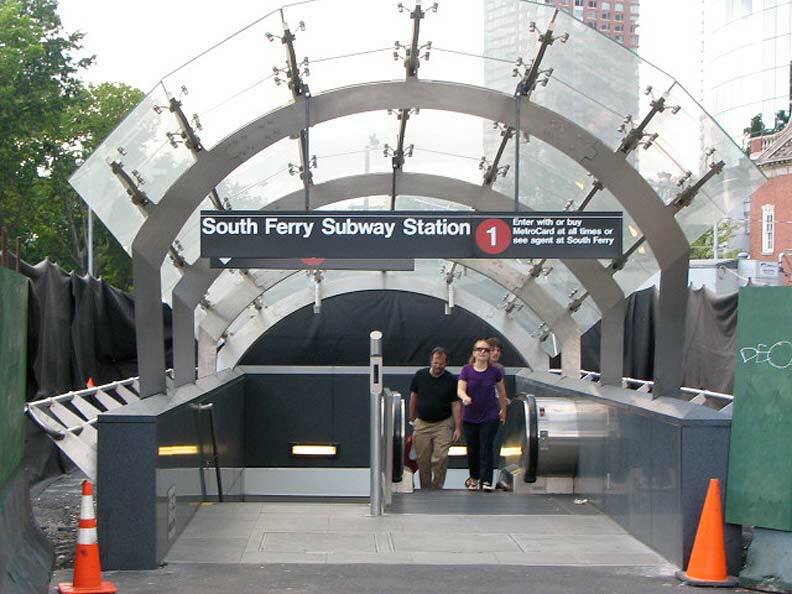 Best of all South Ferry now directly transfers to the Broadway BMT (R, W) so riders can proceed further south to Brooklyn from here, which wasn’t possible previously. 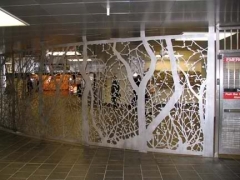 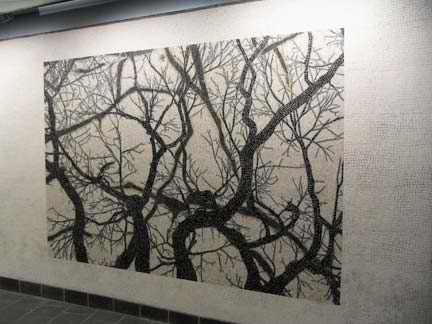 Nearby Battery Park gave inspiration to station designers Doug and Mike Starn, who depict bare tree branches and leaves throughout the station in fused glass, stone mosaic and stainless steel. The installation is titled See It Split, See It Change. 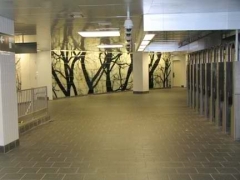 The station platforms are a gleaming, though unremarkable, mix of chrome and white. 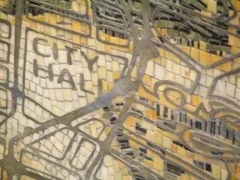 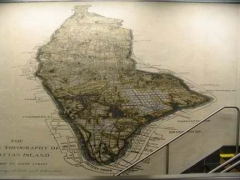 The Starn brothers also designed the mosaic map of Manhattan over a staircase. It depicts a topographic map from the mid-17th Century overlaying a modern Manhattan map. 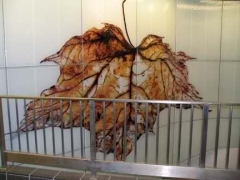 During station construction, workers uncovered a 350-year-old wall. 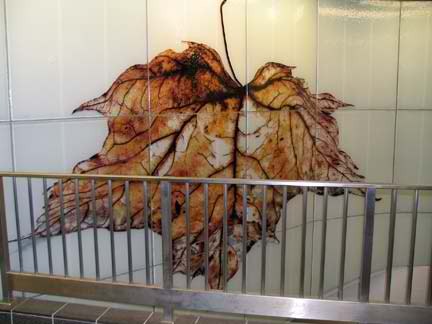 It has been carefully removed and placed within the concourse. 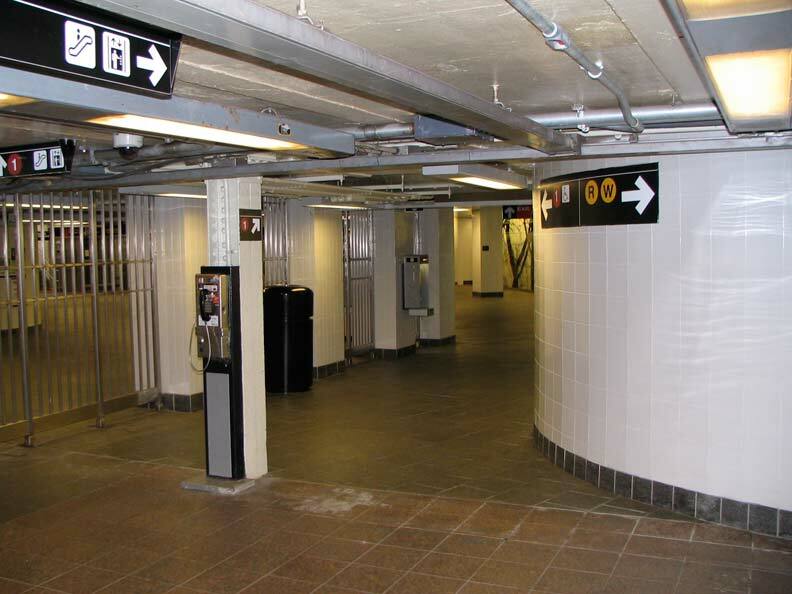 The connection with the Whitehall Street BMT station concourse (foreground) is nearly seamless. 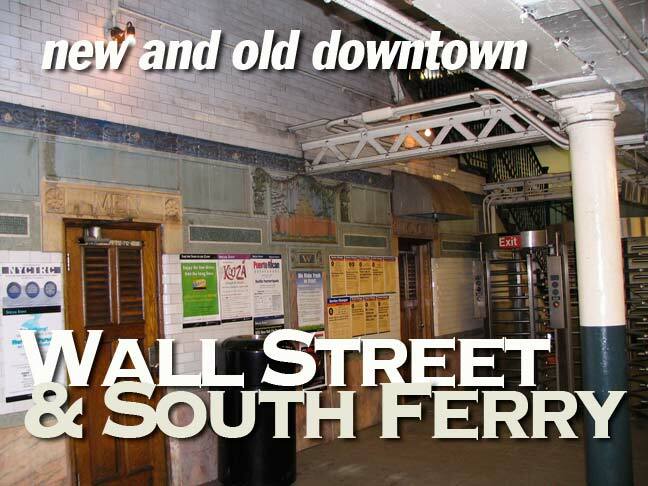 For a detailed look at the new South Ferry station, see Second Avenue Sagas.